From the Cornell Copyright Information Center: interesting copyright info. Did you know the rules about copyright of architectural works? Be careful with books and pictures. You are not so likely to get in trouble with buildings. We do offer you remote access to an incredible image service for public library patrons. Image Quest by Britannica. They have millions of gorgeous pictures that you can download and then use for non-profit, educational purposes. To explore just log in with your library card number. Of course you don't need to have a school report due, or even be a student, to log in and have fun. Enjoy art? Try a search on "light micrograph" There are over 6 thousand images in that single category. If you do use Image Quest pictures in projects (and we hope you do), be sure to cite them properly. Just set aside next Saturday for all thing book. 1. First stop here on the library lawn. The Friends' will sell donated books Saturday May 16th, 10-3. Thanks to the community we have some great books for sale. And the purchases help support our library programs. But no more books, please. We have no room left. We're stuffed. librarians are vaulting over book boxes. 2. Next stop on Saturday? The Gaithersburg Book Festival in downtown Gaithersburg from 10 until 6. Many of our favorite authors will be there. 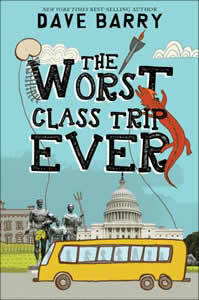 Author/humorist Dave Barry will premiere his laugh-out-loud new kid's book, The Worst Class Trip Ever, Wednesday, May 6 at 7:30 p.m. in the Takoma Park Community Center auditorium. Barry, who won a Pulitzer Prize for his syndicated humor column, also has written a number of books for adults and kids, including the popular Peter and the Starcatcher series, co-authored with Ridley Pearson. In his newest book, Barry tells the story of several eighth graders who travel from Florida to Washington, D.C. on a school trip and find themselves both in trouble with their teachers and in danger from some mysterious men who just may be targeting the President. Publishers Weekly called the book "hilarious," adding: "Pulitzer-winner Barry has the comic sensibility of a middle school class clown. Expect to have lots of trouble keeping this one on the shelf." Politics & Prose will be selling copies of Barry's books at our event, but the program is free and no purchase is required to attend.